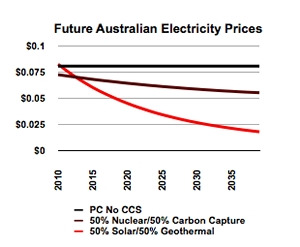 Concentrating solar power and geothermal are in powerful price downtrends not shared by still-theoretical carbon capture and storage and as-yet unbuilt 'next generation' nuclear. 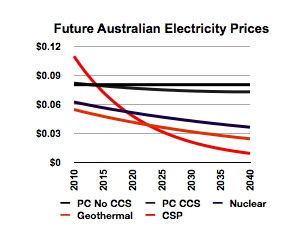 Coal and nuclear power could cost 30% more per year by 2025 than energy from concentrating solar and hot dry rock geothermal power, according to DESERTEC-Australia. The reason is differing 'rates of change' in prices. The price of hot dry rock geothermal and concentrating solar energy is falling rapidly due to innovation. The price of carbon capture and nuclear is not falling as rapidly - and is not expected to in the future, according to DESETEC. “By contrast, 'clean coal' and 'next-generation' nuclear offer only fictitious costs, unproven technologies and dangerous disadvantages,” Taylor adds. DESERTEC-Australia advocates developing large-scale solar, geothermal, wind and wave energy projects in interior Australia.